A box grouping the ballets of Piotr Tchaikovsky may not be particularly original, but this Decca reissue of Swan Lake, The Sleeping Beauty and The Nutcracker performed by the Mariinsky Theatre Orchestra under Valery Gergiev nonetheless requires extra attention. The new liner notes by Julian Haylock coming with the set fail to remind us that these ballets were either created for St. Peterburg’s Mariinsky or made famous by that theatre and to this day never left its repertory. Both The Sleeping Beauty and The Nutcracker were commissioned by the Russian Imperial Theatres and premiered on the Mariinsky stage, respectively in 1890 and 1892. Swan Lake was premiered and flopped in Moscow in 1877, but was revived after Tchaikovsky’s dead by his brother, Marius Petipa and Lev Ivanov in 1895 at the Mariinsky to become the success it still is in theatres around the world. In short, the musicians performing here are continuing a tradition started and groomed by their predecessors for over a century. 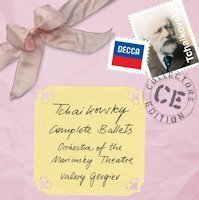 Categories: CD reviews | Tags: ballet music, Kirov Ballet, Marc Haegeman, Mariinsky Theatre, Mariinsky Theatre Orchestra, Marius Petipa, Nutcracker, Piotr Ilyitch Tchaikovsky, Russia, St. Petersburg, Swan Lake, Tchaikovsky, The Sleeping Beauty, Valery Gergiev | Permalink.